Water may be the world’s most endlessly recycled material, but when it comes to turning wastewater into something clean and wholesome enough to be returned safely into the environment, sewage treatment plants have their work cut out. It’s not just the obvious potential ‘nasties’ – pathogens, faecal bacteria and synthetic chemicals – that need to be removed. An overdose of even the most ‘natural’ of substances can often cause problems for the watercourses that receive them. Phosphorus is a perfect example of this, being essential for proper plant growth, but in excess, also capable of fuelling algal blooms in lakes and rivers – and ultimately depleting the oxygen. In wastewater, most of it comes from our diets, but some kinds of detergents also make a significant contribution. Conventional methods to remove it from treated water involve chemical treatment, but as Ruth Barden, environmental regulation manager for Wessex Water, explains, that is expensive, carbon intensive and requires the importation of iron from parts of Europe and South America. Clearly, there is considerable scope for a ‘green’ solution to the problem, and the good news is that some of her colleagues in Somerset look to be about to make just such an alternative a reality, using a new kind of reed bed. 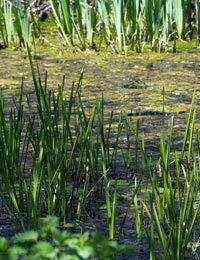 Reeds beds have long been established as a means of cleaning water, making use of the natural ability of reeds and certain other kinds of emergent water plants to pump oxygen down into their roots, and out into the ground around them. The richly-oxygenated wet soil this creates makes ideal conditions to support a thriving population of microbes, and it is these micro-organisms which do the actual work involved in removing the unwanted chemicals. The reeds themselves take up the nutrients produced as they grow, removing them finally from the water. It is a very effective system and for some chemicals, the removal rate is almost 100 per cent, but the one great problem with traditional reed beds is, however, that come the winter, the plants die back and treatment slows to a virtual standstill. Any true alternative to chemical dosing would obviously need to be able to continue to remove the excess phosphorus throughout the whole year. The Wessex Water team think they have the answer, and it involves high metal media. They have set up six trial beds at the company’s Somerton sewage treatment works, each using a different planting medium – steel slag, limestone chips, blast furnace slag, Xylit (a coal mining waste), Bauxsol (an aluminium by-product) and a conventional gravel bed to form the experiment’s ‘control’ for comparison. “The media allows a chemical reaction to take place which removes phosphorus from the water,” says Ms Barden. “This differs from a conventional reed bed where the plants absorb the nutrients. We hope there will be some microbial reactions in the root zone which may also remove nutrients.” This is, of course, the key to the success of the new system; since the chemical reaction within the media itself does not depend on reed growth for its success, it can continue 365 days a year, offering a real potential alternative to the current energy-intensive methods. It is one of the water industry’s first ever, large-scale investigations of this approach, taking around a quarter of the total flow from the facility, and the results so far seem to be encouraging. Careful monitoring is set to continue into 2013, allowing the team to determine which of the media proves to be the most successful, and explore how best to manage the flow through the beds and the optimum concentration of phosphorus that can be treated in this way. If it all turns out the way they hope, the new style reed beds could become Wessex Water’s routine approach to nutrient removal throughout their treatment facilities in the future. With the new EU Water Framework Directive due to come into effect in 2015, which may require all water companies to find ways to remove higher amounts of phosphorus, this innovative new system may ultimately become a feature of sewage treatment plants across Britain – and beyond.